← USA ProChallenge Host Cities for 2015 Announced. Different cities, Going to be a slightly Different Race. Cool! 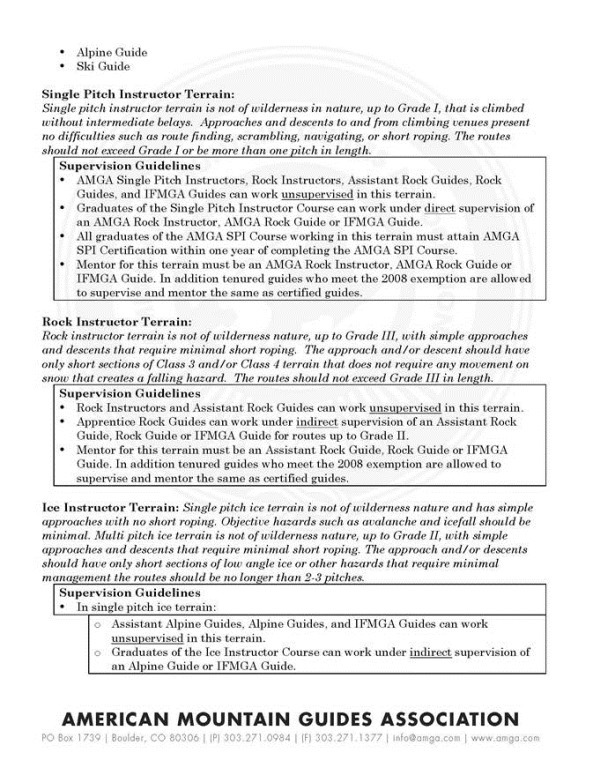 AMGA Terrain and Supervision Guidelines? Making more rules does not make things safer. Rarely does that work, look at the laws concerning our highways and the highway deaths. Making more rules does lead to more lawsuits. Again, look at our highways. The latest actions of AMGA hit a lot of nerves and rightfully so. As usual, the lack of understanding and the desire to create something (not sure what) labeled standards are going to create lawsuits. The new Terrain & Supervision Guidelines won’t solve any problems; they’ll only create new ones. I’ve attached the new requirements here below, so you can review them yourself. If not, you can download your own set here: Terrain & Supervision Guidelines. I’m not sure why the AMGA has created the new requirements. I’ve been told it is a money thing, I’ve been told it is a safety thing, I’ve been told it is a back door into trying to get permits on NPS lands; I have no real idea. I do know it won’t accomplish any of those goals. I did not contact the AMGA to find out what or why. Attorneys love to deal in fuzzy it gives them latitude to litigate. The only time they don’t like fuzzy is when something is solid and proves their case without having to work very hard. The new Terrain & Supervision Guidelines are the classic sharp line to help prove the defendant was wrong and everything else is fuzzy so no one really knows how to help the defendant. I quit providing pro bono legal work to the AMGA over fifteen years ago when another attorney said he could get the AMGA into national parks. I told the AMGA that would never happen. I moved on. Fifteen years later and at least two attorneys failing to pull AMGA guides into parks, the AMGA might be going around to the back door believing the back door will open. Back doors meaning the NPS employees in individual parks who lead the rescues have to deal with the current concessionaires; who they don’t like (familiarity breed’s contempt). It is always easier to like someone who is sucking up in the belief; you can get them in a park to guide. The problem is the door is not at any park; the door is in Washington DC no matter what the AMGA wants to believe. It doesn’t start at 1849 C St NW, Washington, DC 20240, the Department of the Interior address, either, but at Congress. Congress made the laws the NPS, and the USFS are enforcing on commercial guides on Federal lands. Until the AMGA can raise millions, probably $10 million dollars to lobby Congress, nothing will even look like it is going to change. And I suspect that the $10 million is not enough because the current companies that own permits and concessions will lobby against it, and they are bigger. Remember the big hotel concessions in the parks also run raft trips, trail rides and work with climbing guides. However, I’ve also been told that the AMGA has backed off from the position that AMGA guides should be allowed to guide in National Parks. I have found some legal disasters in the new Terrain & Supervision Guidelines. 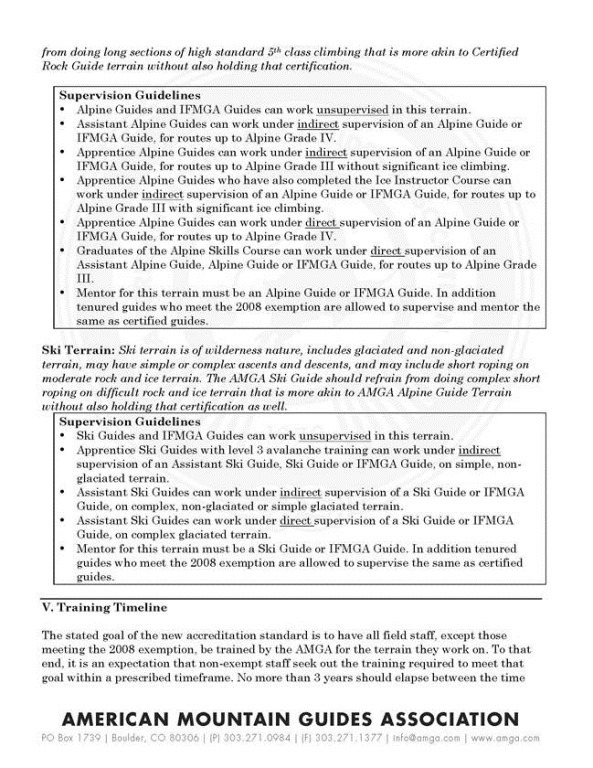 The guidelines require that everything has to be documented “in the guide’s personnel file.” Thank heavens the AMGA has reviewed all HR laws in the US and knows this will not create problems. If personal files are paper, then you better get accordion files. To back this up, you’ll have to collect all the information supporting the requirements in the guidelines first, and then add the review of the supervising guides and the evaluations. Weather conditions, snow conditions, terrain maps, route maps, etc., can take a lot of space in a file folder. My favorite rule is one that requires a guide who has not made the qualifications yet, must be under the direct supervision of a guide who has met the qualifications. Unless the guide, who has met the qualifications, has to take guests down the mountain, then the two guides can be in radio contact. The rules allow the least experienced guide to remain up high, alone. Direct Supervision: Direct supervision implies side by side guiding such as two rope teams traveling near by on a glacier or on nearby multi-pitch routes, daily briefings and debriefings about route selection, strategy, and client care. Side by side guiding and meetings should be documented in the guide’s personnel file. It is the supervising guide’s responsibility to ensure that assigned tasks are appropriate to a guide’s training and ability. It is allowable for the mentored guide to be in radio or phone contact when turning around with clients to descend. What if the guide who has been certified, leaves to summit with a group of clients, can the one who hasn’t been certified stay with the clients who don’t/can’t summit. They’ll be in radio contact? The languages of the guidelines are full of legal land mines. Here are some of my favorites. It is the supervising guide’s responsibility to ensure that assigned tasks are appropriate to a guide’s training and ability. My favorite are the terms applied to different people. So does that mean you are a patrol leader or a star scout? More importantly do you get a badge? Here are some more phrases that seem innocuous but don’t make sense. 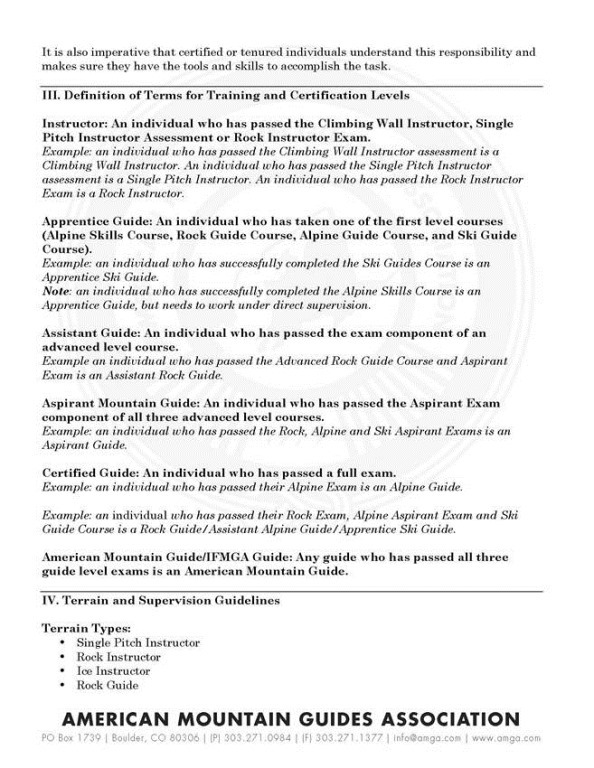 The stated goal of the new accreditation standard is to have all field staff, except those meeting the 2008 exemption, be trained by the AMGA for the terrain they work on. So guides who met the requirements prior to 2008 cannot have a lick of training, sense or experience now and not be up to date on the requirements. How is this going to happen? So I have a concession to guide on Denali. Am I supposed to bring you on one of my trips to tell me that you can train me on this terrain? What about the NPS on this issue and their current regulations. I guess you can come, go sign up and pay the fee, and I’ll take you where I am permitted to go. 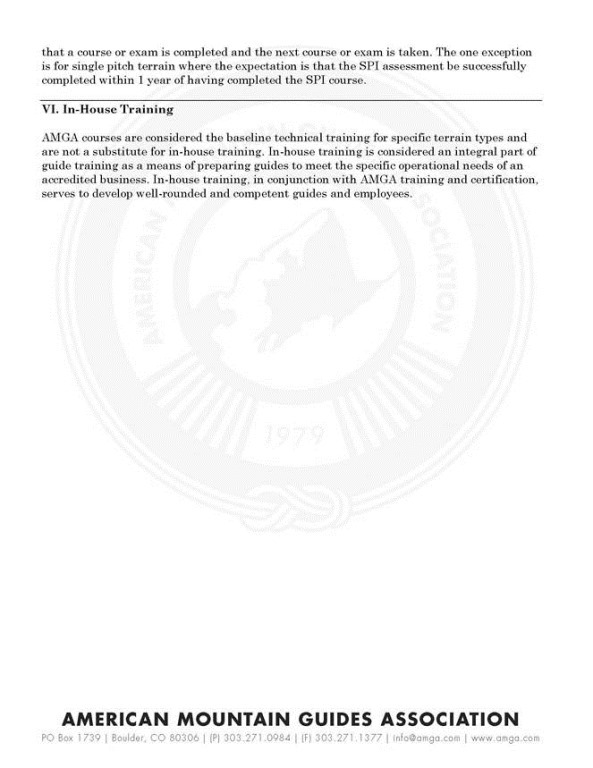 AMGA courses are considered the baseline technical training for specific terrain types and are not a substitute for in-house training. Yet above, they said this is the best you can get? What is this going to mean in court? The AMGA is just the baseline, yet the states the IFMGA (UIAGM) are now the baseline. I doubt that this has been run by the IFMGA (UIAGM). What’s going to happen? The big concessionaire members of the AMGA are either going to leave and financially sink the AMGA or revolt. No one will be happy either way. They don’t need greater chances of being sued. People die on mountains, and I would guess these new guidelines are not going to change that. They know the terrain and have in place, with NPS approval a way of guiding customers and training staff. I have not taken the time to compare these guidelines with current NPS regulations for various mountains. I suspect there may be some conflicts. What is a concessionaire supposed to do, not follow the NPS and lose their permit or not follow these. Let’s see I pay money to the AMGA I make money with my NPS permit. Who am I going to follow? These guidelines, like all standards for people, will only create a checklist for the attorney representing an injured client to sue. The guidelines will be taken and incorporated in interrogatories about each member of the guiding team. One misstep on the mountain or in discovery and these guidelines will change the lawsuit from what we can defend to how much we have to pay. Don’t get me wrong. The American Mountain Guides Association has some of the greatest people I know as members and as an organization has accomplished tons. However, it is faced with an impossible job with no money to accomplish the job: the promise the AMGA made to the IFMGA in 1993 is never going to come through. However, making standards, guidelines for people do not stop lawsuits; they only help the plaintiff’s win lawsuits. Click on the link to download your own copy of the Terrain & Supervision Guidelines. The AMGA use to have some good ideas and training, but the alarming number of Guides that have died in the last decade they have trained or perhaps maybe mostly grandfathered or tenured cannot be ignored. The Alarming number of AMGA Guides that have been Grandfathered and Tenured (no or little training without any examination) will be a Mother Load for Attorneys, Plaintiffs, and the Courts. This goes without mentioning the Labor Laws in the United States. The AMGA’s Sacred Cow or Golden Goose is force membership in order for training credentials to be valid. Forced Unionism as a Condition of Employment is Illegal in 20 or more States in the United States and many of them are mountain states and most of the others have climbing gyms. This statement could never be more true today given US Labor Law, and the International Union of Mountain Guides will eventually get tired of the one sided reach around. Mr. Krause’s comment above is on the right track and at one point back in the 1980’s Mike Covington was in support of his exact comment regarding forced unionism at an Annual AMGA Meeting in Estes Park, CO regarding the Genesis of Guide Certification in the Untied States. Fortunately, many States have enacted Right to Work Laws banning this type of First Amendment Tyranny. Furthermore, it is my belief, that most States will choose to enact Right to Work Laws in the near future. The Janus in June of 2018 was view of what is coming. Hi Jim. Great to read your perspective on this, if a little late to the game. There is a problem that the AMGA has a hard time articulating what it is trying to do to the public for a number of reasons. The way I am reading it though, you (and a lot of others are missing the point. I don’t see any problem with the AMGA doing what they need to do to promote their brand. In order to affiliate with the AMGA as an organization, one must be certified (individual) and/or accredited (company, by the new 2017 standard). What the Terrain & Supervision Guidelines attempt to do, from my view, is to set up criteria that certified and accredited entities must meet or exceed in order to represent and be represented by the organization. You are a lawyer and I am not, so I’ll ask if you are saying that the AMGA or any of it’s affiliates are at increased risk for setting a standard based on industry recognized credentials and hiring/staffing practices? I find it hard to accept that a company could argue that no standards or in-house standards are a better way to go than nationally or internationally recognized standards. The only “backdoor” access game plan I see that can come from this is that US land agencies may decide that they want mountain/climbing/skiing guides to meet the same standards that the AMGA promotes. AMGA certification/accreditation or equivalent may then become a requirement in the commercial permitting process. The precedent for this has been seen in Wilderness Medicine and to my knowledge it didn’t take an act of congress. Even if you are correct that liability could increase with standards, isn’t it true that the insurance companies are the real targets of litigation? Guide services aren’t exactly Forbes 500 companies. It may be that insurance companies demand compliance with training and certification standards before land managers do, for better or worse I realize. If insurance companies demand it though, how long will it be before land agencies will be compelled to take a close look at it as well. What are your thoughts on that speculation? If a concessionaire does not meet the standards being promoted by a big player like the AMGA backed by the IFMGA, they ought to have a good explanation in court don’t you think? The AMGA cannot change the risk? What the AMGA will do will be to make it easier to sue outfitters and guides. Your comments are not real clear, or actually, confusing to some extent. The USFS and NPS will NEVER require it. Joshua tree, by law must accept a non-AMGS guide if someone wanted to push it. That has been and will always be an AMGA pipe dream. “Even if you are correct that liability could increase with standards, isn’t it true that the insurance companies are the real targets of litigation?” What do you mean by this? Who pays the insurance companies. Do you have any idea how hard it is to find insurance as a rock climbing or mountaineering guide? Do you know how much of a premium increase would occur if just a few lawsuits occurred. If lawsuits increase, even if the guides win, there will be no insurance. It is not like you can walk down to a local agent and buy mountaineering insurance. The largest insurer of mountaineering and rock climbing has already sent a letter saying they are opposed to the standards. This could end mountaineering and guiding in the US because insurance would not be available. “It may be that insurance companies demand compliance with training and certification standards before land managers do, for better or worse I realize.” Not at all. The basis for your comments is the hope that the NPS or the USFS will require AMGA guiding. Whatever a local land manger wants must comply with federal law. The law basically prohibits it. Thanks Jim your legal perspective is refreshing. First though, I am not sure why you are confused, and my writing may be unclear, but it may be that you seem to think this: “The basis for your comments is the hope that the NPS or the USFS will require AMGA guiding.” The basis for my comments is that these federal land agencies may require guiding proficiency standards in the interest of public safety. That is different from requiring “AMGA guiding.” If you can’t agree that the law allows for this then I would be interested in your explanation of the mandate for all of our guides to hold a Wilderness First Responder certification, CPR certification, and a Food Handler’s certification. In the prospectuses for commercial permittees conducted by the USFS, BLM, & NPS, there are criteria for evaluation that also factor in trainings for guides in Leave No Trace and AMGA certifications. These are weighted arbitrarily and at the discretion of supervisors at the district/park level. So there is plenty of precedence for using standards – even specific ones developed by specific organizations – to grant access on public lands. I understand that they must by law provide equal opportunity, but they also have latitude to narrow the field to certain qualifications and credentials and legally rule out businesses that apply on those bases. To my knowledge, no land agencies are obligated to permit any business to operate for any reason, even if someone “wanted to push it” and I am not sure how you can arrive at that conclusion considering how hard so many individuals have indeed “pushed it” over the last 2+ decades. Since I own and operate a permitted guide service I do have an idea what it is like to obtain and maintain liability insurance. Not terribly hard, but definitely too expensive. We have not had a lawsuit against us to date so I cannot speak first hand to the experience of those conditions, but a colleague of mine was recently able to get secondary insurance even while being litigated against (a frivolous lawsuit that did, as you predicted, invoke the proposed T&SG). I do hear your assessment and I wonder what would happen if guiding liability insurance went away completely. Land agencies are mandated by law to provide for these services to the public, and they also require permitees to hold insurance. I hear you saying that an increase in litigation will likely result in no available insurance which will in turn lead to the death of American guiding. This will all result from the development of defined guidelines as proposed industry standards by the AMGA. Is this your prediction? If so (although it might not be in my own best interest in some ways), I might like to see that go down. It would be really interesting to see the battle over what guiding standards should in fact be, and I imagine that there would be a strong movement in line with your assessment that it would be better to have no standard than defined standards, because at least no standards are insurable. Completely ludicrous to me, but again I am not a lawyer. It get’s worse they just elected a new board president that campaigned on this. 51% of the AMGA voted for Rob to the board and the board unanimously voted him to be president. The bottom line is these people want only AMGA guides to have access to all the pubic lands. The AMGA is becoming the most dangerous organization for access for us all. In my opinion, I think the intent of the new Terrain and Supervision Guidelines is an effort to have guides with some formal training for the terrain they work in, and to provide a system of mentorship within the industry. For example, currently in my area, we have guides who work for AMGA accredited businesses, and unaffiliated guide services working in alpine terrain who have zero formal education in how to manage that terrain. They may or may not have completed the AMGA’s SPI program, but it is not intended for that terrain. One service allows guides who have not had any formal technical training lead trips up and down Mt Washington where there is significant avalanche hazard, extensive short roping, and challenging navigation in a place sold as ‘the worst weather in the world’. The same guides are working in multi pitch rock terrain and ski guiding with only recreational level experience. Basically, guides are misrepresenting themselves to the public, and that is demanding change. The new titles represent alignment with other UIAGM/IFMGA member countries, which the AMGA has not been concurrent with. While there are indeed some holes in this document, it is a way forward. In the end, we need to look out for our clients best interests. Having a formal training outline builds a guide’s ability to make sound decisions, use good judgement, and helps to build their professional resume. Believe it or not, guides need to have a mentorship program and it is often in house. You are making two different approaches to the same issue. Guidelines and Training. I believe/support and would strongly suggest you create training for the issues. I also agree with mentor-ship. What has education and mentor-ship got to do with the Terrain and Supervision guidelines. Those are not training and those are not mentor-ship. Those are only ways you can screw up without even any punishment attached other than litigation. Nobody learns from litigation. Since when was it AMGA’s job/mission/purpose to determine who can do what. Come up to me guiding in the mountains and tell me I’m violating your rules and I’ll run you through with an Ice Axe. come and offer to help or make a suggestion and I’ll buy you a beer if we get back. Nothing in the UIAGM says they must control how people do things. the UIAGM states if you want to work at the highest level you need to be able to do this. Once you do this, you get a pin. PERIOD. Different countries allow people with the pin to do various things. Not the UIAGM. Besides isn’t it the landowners/park/forest service job to make the rules the want for operating on their land. Not the AMGA’s. For the first time the AMGA is trying to tell landowners what people should be doing on their land. Who is misrepresenting themselves to the public? You want to look out for “we need to look out for our clients best interests” then take all the training in the world. Become the best in the world. But don’t start lawsuits because you don’t like the fact someone is doing something in a way that you don’t like. Nothing you stated here justifies the actions of the AMGA. Everything you want to accomplish can be done in much better ways. AMGA is not moving forward it is moving over the edge. Your current president ran on a ticket that stated he was in favor of AMGA guides working on federal land? AMGA needs to understand that they are not big enough or wealthy enough to change the law. Even if they get to that point, they have to fight the current concessionaires who won’t allow a change. The NPS in the Grand Canyon owes one Concessionaire $200m dollars. AMGA needs to realize that this is not just a guiding issue, it is a concessionaire issue and they are going to be fighting big guys to win this. They can’t and these rules are the dumbest attempt to do so.